Think you’re already traveling light? You can probably travel even lighter. Three months into long term travel I’ve realized that I really don’t need as much as I first thought. 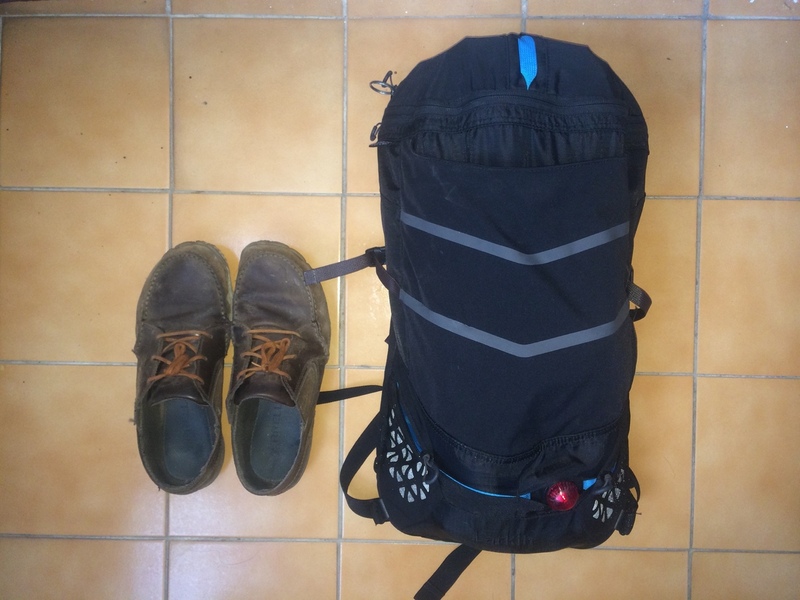 Setting off from a developed country it was easy to think that I would be constantly bored and without clean clothes, water, or a comfortable place to sleep. It turns out that I need very little every day, almost everything can be bought on the road, and carrying less is always more pleasant than lugging something I don’t need. Recently I’ve redone my packing list to fit into an 18 liter day pack. Most travelers that I’ve seen at the airport are forced to check a 40-60 liter backpack. My first pack was 26 liters and fit comfortably into an overhead bin, my new 18 liter pack1 slides under the seat in front of me in economy class. The fact is, most people traveling Southeast Asia could go far lighter. I’m carrying a Macbook Pro and a full frame camera kit for producing this website. I’m also carrying full winter gear: a down jacket, thick socks, long underwear, hoodie, and a wool cap. If you cut all of this from your pack, just carried an iPhone as your camera and computer, and only wore minimalist sandals you could probably travel with 10 liters. Most of this shockingly small pack is based around dual use items. I’m still surprised at how small it is. I no longer carry shorts, I just wear my swimsuit. I no longer carry a sleeping mask, I just use my wool buff pulled down over my eyes. For a while I carried a Canon S120, which is a fantastic camera, but the last time I went to use it had sat idle for so long that the battery was dead. I found a good deal on a used iPhone and just use that as both my phone and point and shoot camera now. My backpack is an 18 liter Boreas Larkin. When I first saw it in Bangkok I was actually considering buying a larger pack so that I could carry a full sized tripod, but the Larkin was so comfortable that I decided I could just cut a few more things from my gear list and carry everything with this2. Now I can use my travel pack as a day pack around town, wearing it all day with no fatigue. I don’t even think twice about going out for an afternoon without the bag — there is no reason not to carry it. 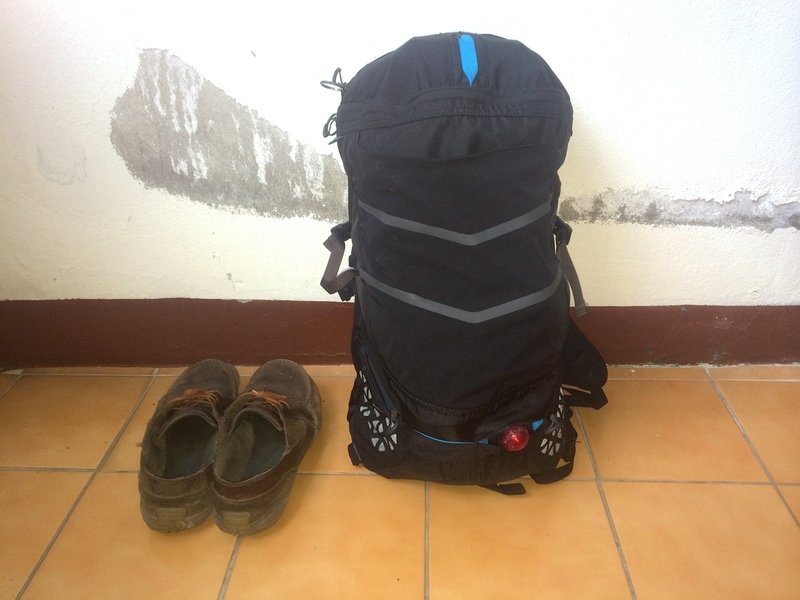 The packed bag, next to my shoes for comparison. All in it weighs roughly 6 kilos. The Boreas Larkin works great as an every day around town pack. I keep my stuff organized into what I need all the time, what I need in my hotel, and long term storage of things I rarely need (emergency medications, passport photos, tape, etc). 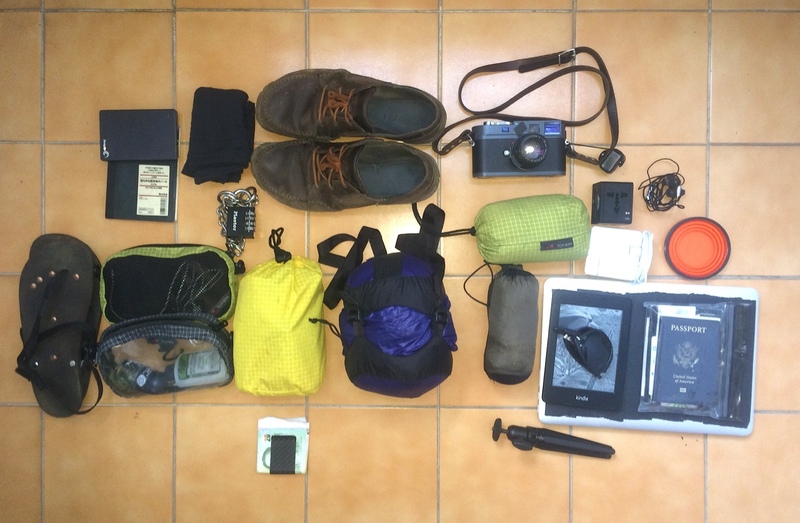 When I arrive in a hotel I leave the clothes, long term storage bag, and the toiletries in the room and head out to explore with a 5-6 pound pack containing my laptop, camera, rain jacket, and kindle. Having my laptop always with me is kind of awesome because any excuse to sit down and relax for a while on the road is also a chance to get some writing or work done. Below is my revised packing list. Shirts Two Applatch v-neck wool shirts. These are my favorite wool shirts I’ve found. The cut fits me well, the v-neck is a little more stylish than a crew neck, and the front pocket is useful. I have light blue and gray colors. They do discolor a bit in the armpits and I haven’t figured out if this is deodorant or the dye coming out. Hat A wool buff. The most useful travel item I own. I use this as a sleeping mask, a sweat band in hot weather, and a hat or scarf in cold weather. Shoes Merrell leather barefoot shoes. These aren’t exactly stylish, but they’re good enough to wear to dinner in a pinch. The shoelaces that come with them break quickly so you may as well replace them before hitting the road. Sandals Ultralight running sandals, my model has been discontinued but these look even better with more grip. I almost never wear these and I’d throw them out if they weren’t useful in a pinch when my other shoes are soaked. Check out Tynan’s review as well. Pants Rohan Stronghold Trousers. Decent looking pants, strong as hell — they didn’t rip when I crashed a motorcycle in them — and they have secured zippers in the front right pocket and back right pocket. The front left pocket has a key chain ring built in where I clip my flashlight. Swimsuit/shorts: Patagonia Men’s Light and Variable Board Shorts. Not much to say about these except they are light and very thin. The only have one tiny pocket in the back but since I always have my backpack with me this isn’t a big deal. I wear them both for swimming and as shorts on extremely hot days. Two pairs of socks: thick icebreaker socks and thin smartwool socks. Underwear:Two pairs of Icebreaker Anatomica Boxers. They are comfortable and dry quickly. Since they’re made of wool they barely smell at all even after being washed in the sink for weeks. The ExOfficio boxers are great for daily wear but will start to smell very bad after washing them for a few weeks in the sink. Icebreaker Leggings as a layer to go under my pants on cold days. Down Jacket: My favorite was the MontBell Ex Light, only 5.6 ounces with no pockets or hood. It’s super warm and when layered with my hoody and rain jacket I’ll be comfortable down to freezing tempertures. The Patagonia Ultralight Down Hoody is also very good but way bigger and almost twice as heavy (9.6oz) . Credit to Tynan’s blog. Rain Jacket: The Outdoor Research Helium 2. It’s only 6.4oz, folds down very small into its own pocket, and does an excellent job keeping me dry. It’s much smaller packed down than any other rain jacket I’ve owned. Credit to Tynan’s blog. An 13 inch Retina Macbook Pro. I had an Air before, but the screen was too low quality for editing photos. All my photos need to be re-edited after seeing them on the bigger screen. It’s a bit faster than the Air was, and the included SD port is really nice for pulling images from my camera. Overall it adds more than a pound to my bag. A 16 gig black iPhone 5s. This double as a handheld camera and as a phone. For $450 used in Thailand I’m glad to have this with me and sold my old phone and camera to more than cover the purchase price. A Leica M9 and 50mm F2 lens, just read my full review. But I don’t carry the full 1 meter charging cable, I just use a figure 8 right angle adapter which is way smaller and lighter. A travel charger that adapts to all countries and includes two USB ports. (Mine is an identical product but from a different brand). I tried two other travel adapters before settling on this one. It’s the best. Mini USB 3 cable for use with my external hard drive and kindle. Kindle paperwhite 1G. The battery lasts forever and it’s nice to have this around for distraction-free reading. Backup hard drive with a disaster recovery plan. A Tom Bihn money belt that works as an actual belt. I keep some cash and important notes in there. It could also easily fit a micro SD card if you wanted to keep data safe, but Dropbox is much more secure. Awesome small flashlight. I keep this clipped to the left pocket keyring of my pants at all times. I lasted me for three months of regular use on a single AAA battery and was waterproof enough for swimming through caves in Vietnam. A small and bright flashlight is one of the best self defense items you can carry: it keeps your path well lit and a model like this lets you push quickly on the back to make a flash of bright light and blind an attacker. I’ve never had to use the light this way but it was recommended in a self defense class. Travel sleeping sheet. I have only used this a handful of times but I hear they are very useful in India so I’m keeping it for now. One tip is that a silk sleeping sheet is almost always more comfortable than the sheets in a hotel, so this is a really comfortable way to sleep even if you aren’t worried about bed bugs. Collapsible cup for coffee. It’s easy to get hot water everywhere, it’s hard to get coffee everywhere, so I carry this and some instant coffee (Starbucks Via is the best, but it’s expensive). Carbon fiber money clip. This gets a lot of compliments and is useful for holding all sizes of bills. After four months it hasn’t lost it’s spring and still hold a single bill or 50 bills equally well. An external phone battery. My old Macbook Air laptop couldn’t charge my phone while sleeping, but this new Macbook Pro is able to do it. So I may give away this external battery soon. There are a few really tiny things not worth itemizing: earplugs, headphones, antibiotics, my lock and chain for securing my bag and a flashing light to go on the back of the bag — but basically that’s it. Living with so little is kind of awesome. As I travel I repack my bag every day and am forced to think about what’s in it and what can be discarded. My friend Steve Davis calls this my “packing kaizen”. When the contents of my bag got smaller I realized there was no reason to keep my laptop in a dedicated sleeve, this meant that I could bring my laptop with me everywhere, which in turn means I probably don’t need my dedicated power bank to charge my phone, and that in turn means I probably don’t need a dedicated USB wall charger. Over time these refinements build on each other and keep making my gear list smaller.